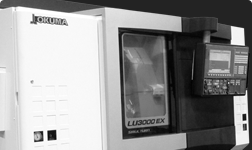 What has long made Okuma a leader in 4-axis machining is a unique combination of structural stability for long-term reliability, and the easy-to-use THINC-OSP P300 control that makes programming and setup a snap. Both models have a 45-degree box bed with all box way construction for optimum support of the carriage and cross slide. The spindle has 3-point bearing support for accuracy, balanced turning and long life. In these high production turning centers 2 tools work simultaneously for greater removal rates and process flexibility, plus, because of the large work ranges of the upper (V12) and lower (V8) turrets, there is less interference. 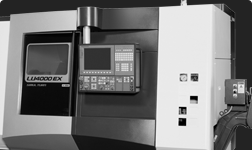 Okuma’s Thermo Friendly Concept that prevents temperature changes from affecting workpiece accuracy is standard. The optional milling function uses live tooling bolted to the turret, BMT-style, for optimum support and power. Other options include big bore spindles, Collision Avoidance and Machine Navi for even greater performance. Easy-to-use multitasking 4-axis horizontal lathe in the 8-10 inch chuck class. Easy-to-use multitasking 4-axis horizontal lathe in the 10-15 inch chuck class.